Four guys from Los Angeles explode onto the music scene by fusing the best of rap with monstrous metal and demanding nothing short of a revolution. 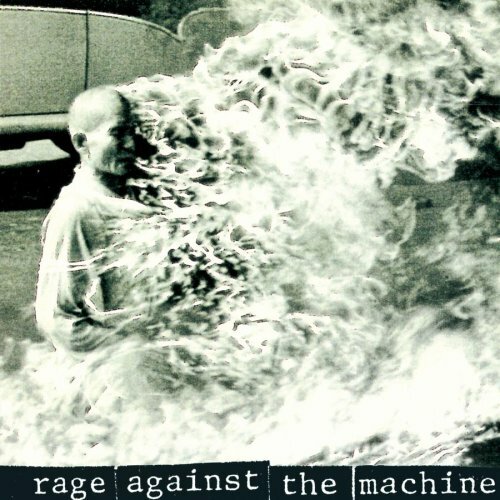 The self-titled debut of Rage Against The Machine wastes no time in positioning the band at the forefront of any leftist, anti-establishment, anti-corporate movement that chose to adopt them. And out of the box, the music was massive enough to support the ambitious message. Bombtrack, Killing In The Name, and Know Your Enemy have stood the test of time remarkably well, and sound as vital today as they did in 1992. Opener Bombtrack is a stunning career introduction, with a simple riff that is a most dangerous combination of languid and brutal. Killing In The Name is best known for its repetitive "f**k you I won't do what you tell me" in-your-face ending that immediately ensured the status of Rage Against The Machine as anti-authoritarian symbols; but preceding that climax is a hypnotic, unstoppable metal machine of a song chewing up the landscape of indifference. And the opening power riff of Know Your Enemy is enough to pulverize a hole in any concrete structure. Bullet In The Head is only slightly behind in terms of impact. The other tracks are generally fair to middling, but are always enlivened by the innovative sounds that Tom Morello coaxes out of his guitar as Zack De La Rocha spits out the lyrics. Rage Against The Machine introduced a new band; established a new sound; and achieved the rare feat of wrapping a purposeful lyrical message in an impressive metal music package. Produced by Rage Against The Machine and GGGarth. Mixed by Andy Wallace. Recorded by Stan Katayama and GGGarth.